I have heard about the next Jackie Chan film few months ago which was unlike his more recent comedy action movies. When I saw its trailer few weeks ago that confirmed the news, I have set up my mind to see this one with my wife. The movie actually premiered in Indonesian theaters on Friday, but I chose to see another movie then and wait till Sunday to see this. Sadly my wife could not accompany me despite her being a big fan of Jackie Chan, since she was not feeling well and preferred to take a rest at home. So off I went to the cinema nearest to my home & watch the 5 PM show. Now let us go on with the movie. Quan Ngoc Minh (Jackie Chan) was a Chinese who had emigrated to London since 1984 and became an England citizen. His normal life was torn apart when his only girl Fan (Katie Leung - as Cho Chang in Harry Potter movies) became a victim of a bomb set by Irish terrorists called UDI who claimed responsibility for the attack. In Ireland, the deputy minister Liam Hennesy (Pierce Brosnan - Mamma Mia! and as James Bond in 4 movies, etc) was getting a lot of heat from the British government to find out who were responsible for the bombing. Being an ex member of UDI who used to attack the British made Liam had possible access to those terrorists. However, it appeared not to be that easy. Meanwhile, Quan who felt that he had no one else in his life, kept on asking the police and was turned away all the time without getting a satisfying answer. Until he heard that Liam might know who they were which led Quan to start looking for answers in Ireland where Liam resided. So could Quan find the answers he was looking for? Could Liam really help Quan? Find them all in this action thriller movie. Well as I said above that this is unlike Jackie Chan's more current action comedy movies and it was indeed so. By comparison, I felt that this was more like his performance in Shinjuku Incident or in Police Story 2013 which had a dark and serious tone. I felt that Jackie Chan really did his best to show his acting capabilities in here. His performance as a father who lost his child turned to a persistent "warrior" who would stop at nothing till he got what he wanted was amazing. He was really convincing as a 60 year old man (even his walks at times really looked like he was a tired old man). And his expressions in various scenes were really good. This movie's strength was not solely reliant on Jackie Chan's fighting abilities but more to the storyline itself. I think Pierce Brosnan's performance here was awesome. His characterization of Deputy Minister who had to endure the constant badgering from Quan was also great. I felt that these two senior actors had a good chemistry and provided an unusual cat and mouse style of "relationship". Not to discredit other characters but the main reason this movie was interesting was the performance of them. As an action thriller movie this one was done in a pace that was not as fast as a full blown action movie. 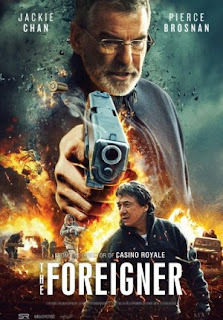 So those of you who are looking for the thrills of an action movie or the light funny performance of the beloved Jackie Chan would not be able to find those here. The film was adapted from the novel titled The Chinaman written by Stephen Leather back in 1992. It was directed by Martin Campbell who happened to also directed Pierce Brosnan in Golden Eye. He also had other action movies to his credit such as Casino Royale, Vertical Limit, The Mask of Zorro and few others. The special effects were quite awesome, especially the explosions effects. The sound effects were OK but not great. The make up effects were good. The fighting sequence was done nicely and I totally loved the climax of the movie. There was a nice Mandarin song that was sung by Jackie Chan (I think it was titled The Common Man) during the end credit scene. Since it was not a movie directed by Jackie Chan, there was no bloopers that we usually saw in his other movies (and no post end credit scene either). Be reminded that this is not a movie for kids as there were some brutal scenes and even few love making scenes. So for parents who usually thought it was safe to bring their children to see Jackie Chan's movies, this one is certainly not one of those. Finally I was entertained by this movie. Despite having a rather slow pace, the movie's duration of 1 hr 50 minutes was sufficient to cover all the things that the director wanted to show us. For those of you who would like to see a different kind of Jackie Chan movie then this surely fit the profile. But if you prefer to see him in his usual stereotype role of funny guy with his trademark fighting style, then it would be better for you to watch his other movies. The choice is yours.